Preheat a large skillet over medium high heat. Add 2 tablespoons extra-virgin olive oil. Add ground turkey and season with chili powder, cumin, onion and garlic. Brown the meat, 8 minutes. Add tomatillo salsa, black beans, corn, red peppers, jalapenos and lime zest and juice. Heat the mixture through, 5 minutes then season with salt and pepper, to taste. Coat a shallow baking dish with remaining extra virgin olive oil. Build lasagna in layers of meat and beans, then tortillas, then cheese. Repeat: Bake lasagna 15 minutes until cheese is brown and bubbly. Top with the scallions,cilantro and sour cream and serve. This sounds delicious and I love Mexican food! As a newbie to the vegetarian world, though, I was wondering if you had any suggestions for veggie alternatives? I would say a Sangria or Pinot Grigio. Another drink that would be good would be beer of course. I made a Mexican lasagna for a work potluck food competition. I was the winner voted by my peers. 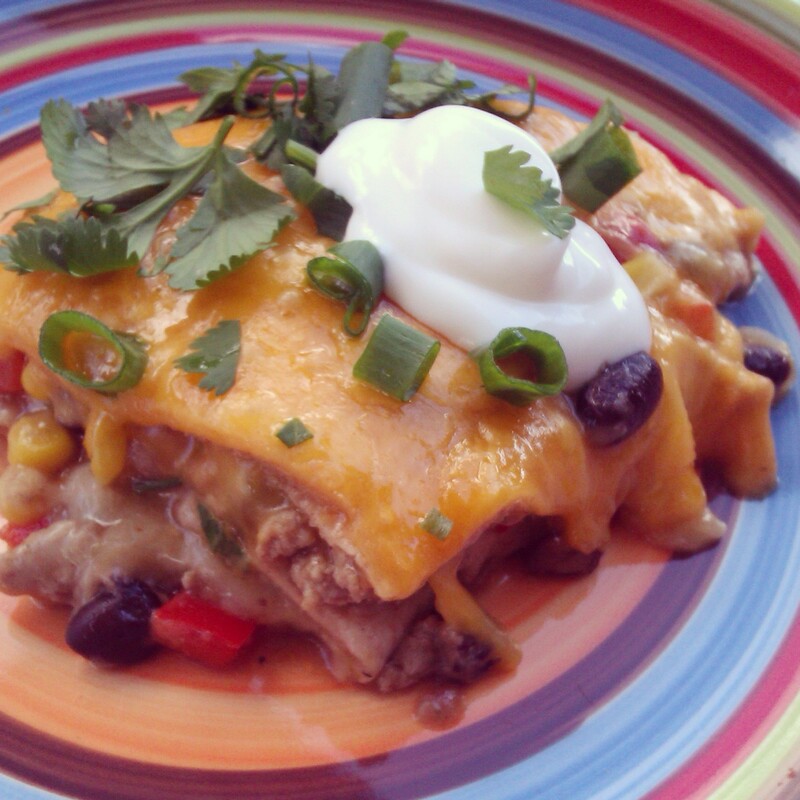 Mexican lasagna is so delicious ! LOVE this idea! Sounds delish! I’ve made a version of this before, but I’m excited to try your version with cilantro, tomatillo and lime juice. I think those ingredients will send my standy-by dish to deliciosity levels! Oh this sounds likes such a wonderful tasty idea. Italian and Mexican are my two of favourite things, so something that feels like i’m eating both is amazing!